I am a beginner to Bonsai. 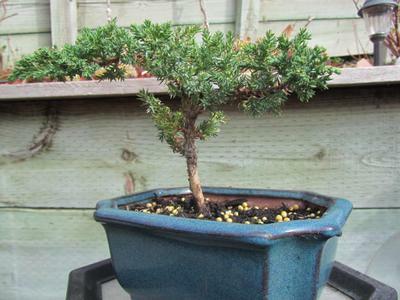 I bought a small Juniper to test my merit. It dried out quite badly last summer when I went on vacation, but I have continued to soak the plant every 10-14 days, and water when needed. I trimmed the bottoms of the branches for the first time, yesterday, but I am reluctant to cut one or two off for presentation. Any suggestions? I am also working to remove dead leaves that are a result of last summer's damage. I think the little tree has a good initial shape. Should I cut off the limb protruding towards the viewer for a more silhouette-type shape? I got the plant pre-potted, and I feed it with time release fertilizer.